Cinder House is the product of a recent renovation of the old Cielo Restaurant at the top of the Four Seasons Hotel in downtown St. Louis. This tenant improvement project included interior and exterior demolition, steel erection, roofing, drywall, sheet metal, plaster, plumbing, millwork, and glazing, along with lighting, seating, stone tops, and other various high-end finishes. 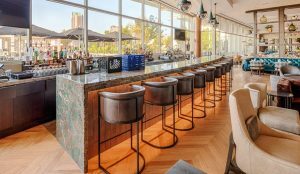 The rooftop is complete with a second bar, lounge areas, and expansive views of the St. Louis arch and downtown.